I do some fishing off the Juno pier but lately it's been really slow, any know what's the best pier for fishing these days? 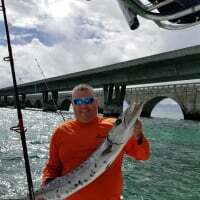 Without a doubt, the Juno Pier is the best fishing pier on planet Earth ! It is legendary and has the highest percentage of fish activity / action ! I personally liked the catwalk under the bridge on Route 1 going from Jupiter to Tequesta. Just my thoughts. Aside from Snook you'll need to wait another month or two for the northern blows. I used to fish there allot, the first couple of days of northern wind lights it up. Coincident with this will be the mullet run. Early AM or late PM, high sun notsomuch. Juno Bait & Tackle is great resource. Forgot to agree with poster above, Juno Pier is the very best one. Have been to others a few times. Only went Deerfield pier once, was dirty diapers and trash everywhere, nasty. If you take valuable gear, bungee it to the railing so it can't walk off easily. Watch the casters carefully or you'll get a hook, there's sometimes not much courtesy to be found.